As students of the martial arts we must wonder from time to time whether or not our training methods will be effective in the event we are forced to defend ourselves or our families against attack. A few hundred years ago in China, the bodyguard/caravan guard business was booming as many outlying rural areas did not have the protection of a large police force to ensure the safety of the residents and merchants who would travel through those areas. As a result, the martial artists of the day were given the ultimate proving ground for there training. Without the benefit of firearms, those charged with the security of others had to rely on their ability to fight without weapons, or with medium to short range weapons, combined with their abilities in movement. So, one could imagine that theory and practicality would merge, and the training of the martial artists in those days would have to be effective. Their lives depended on it. It was during times like these that many of the classic martial art texts were written. Now that we are in different times with modern police forces equipped with firearms, the martial artist of today makes his living by teaching in an air-conditioned studio, a local park, and through writing as well as video. The heroes of days past like Sun Lu Tang have been replaced by Jean Claude Van Damme (what does that say of our society?). Anyway, when a would be student goes to select a school/style to join he/she presumably has a reason in mind. For example, I want realistic self-defense, or conditioning, or to win trophies in a tournament. All are valid reasons as long as you are honest and don't try to fool yourself with the purpose. Equally important is that the school or teacher be knowledgeable and responsible enough to honestly represent what he has to offer. In this article, I would like to discuss and reassure the reader that the internal martial arts of China are excellent, if not superior, in terms of real self defense in today's street encounter. I have studied many different styles over the years and have had the benefit of some good training. The best has been the past five and a half years studying the internal arts. How do I know it works? I am a Deputy Sheriff in Broward county, Florida where I have been assigned to the unincorporated area of Ft. Lauderdale for the past 5 plus years. We have the dubious honor of being number one in violent crimes per capita in the U.S. according to the FBI. Three of my friends that still work this District have been shot while working here and many more of my friends have scars. Some have died. I have been in many real fights and I take my training seriously. I have chosen the internal arts to help me in developing skills that are effective on the streets. They will serve you well too. Many more qualified than I have explained the differences between internal and external martial arts. Suffice it to say that the internal arts develop and nurture qi through relaxation and a structure that facilitates its flow. There is not the reliance on muscle that is common in external methods. This reliance on structure, qi flow and relaxation almost naturally forces the practitioner to rely on principles as opposed to techniques for which external styles are famous. It is my opinion that a good foundation in the principles of fighting will allow any technique to work provided that it is employed naturally and no other principles are violated. A sound foundation in principles and a good knowledge of strategy will serve the student well when it comes to a real fight. What are these principles I am referring to? 1) ROOTING: rooting is a term used to describe a relaxed body for the purpose of increased stability, and mobility. This is the base of our hanging posture in which we suspend the body from the top of the head thereby straightening the spine to allow an unrestricted flow of chi through the spine. Also, this powerful yet mobile base tends to deceive our opponent as the upper body is quite relaxed and ready to yield while the rooted base is very powerful. 2) YIELDING: yielding is the instinctive reaction of not resisting force. While there are many ways of not resisting, our method seeks to remain in the fight and improve our position by yielding enough to avoid a force vs. force confrontation but not to completely disappear so that we are out of position to attack. Yielding can actually help us improve our positioning to attack relative to our opponent. 3) UNITARY THEORY: unitary theory teaches one to use the whole instead of a portion. With the aid of the ground, we are able to use our body as a unit instead of a segmented portion and generate tremendous power with what appears to be minimal effort. A unitary boxer never needs to load to strike. He may instantly strike from whatever his position may be. 4) BODY STATE: body state is a principle which is quite elusive and always in need of fine tuning. This is the relationship between the muscular tension in the body and our internal energy. The most frequently used term when one begins to examine body state is sink and relax. By sinking and relaxing into a rooted posture one is very stable, however this does not mean that you sacrifice mobility. A relaxed body is much quicker to act and has greater ability to project force. 5) SIX-NINE THEORY: six-nine theory is crucial when we actually discuss fighting. Quite simply, this is retaining the ability to change. Under this theory, every action that you take should leave you in position to continue your attack or defense in a fluid manner without being overextended or vulnerable to attack. 6) CENTEREDNESS: centeredness deals with the acute awareness and protection of your own center as well as the awareness of your opponent's center and your relation to it. 7) FORWARD PRESSURE: forward pressure refers to a mental commitment to close the gap at the right time and seize your opponent's center to finish him. On a physical level, it involves establishing touch and reading the opponent's energy from a covered posture with an eye towards protecting your center and seizing his. 8) LINE AND ANGLE: line and angle is the study of efficiency and economy of motion in terms of both offense and defense. 9) PROJECTION: projection is the study of creating energy within the body and delivering it into your opponent. Here we examine the use of the ground, unitary as well as body state theories. 10) MIND HIT: mind hit is of great importance. Here we must control our mind and emotions to remain calm and focused in the moment. We study the disruption of our opponent's mind and seek to protect our mind from his. The mind is our best weapon. 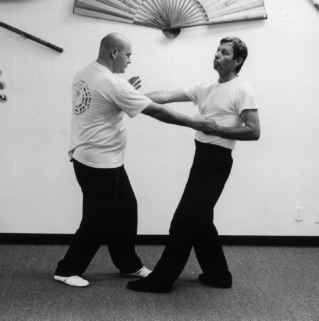 I believe that no matter which of the internal arts you study, be it Tai Ji, Ba Gua, or Xing Yi, you would be well served to train with these principles in mind. It has been said that every technique will work and every technique can be countered. When the foundation of your training is based on principles it will not matter what technique you use. Do what is natural and you will be surprised. All right, you are a student of the internal arts. You have a good foundation in your form and you are now able to move in accordance with sound principles like those mentioned above. Are you ready to fight an opponent larger and stronger than you? What if he is also a skilled fighter? 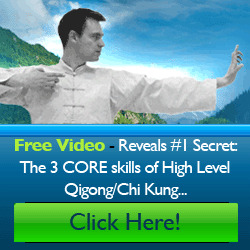 Do you need more than a Tai Ji long form and pre-arranged exercises? More than circle walking and a good single and double palm change? More than a linking fist form and joint hands? I believe that you do. While the aforementioned skills are great and essential, I believe that to be a good fighter you need more. You need a good working knowledge of strategy, the ability to control distance through footwork, nontelegraphic skills, and some experience in combination development. Concerning strategy there are three that are universal to any style be it external, internal or just a street thug. They are offense, yield and counter, and stop hit. Offense: photo 1a shows myself and an opponent squared off. I attack with a forefist as shown in photo 1b. I try to accomplish this without telegraphing my intent. successful, especially if the fighters are of relatively mediocre skill. The fighter who opts for an offensive strategy generally wins as the advantage of a surprise attack that continues with intensity often overwhelms the opponent who is either defeated quickly or gives up. Yield and Counter: Yield and counter, sometimes called block and counter, is very popular and works for many people. Now, why did I not use the more common term "block and counter"? Because block implies too much resistance to force. Specifically, a block can range any where from a complete confrontation of the incoming blow where you over power it and deflect it with your superior force to a light touch of the incoming limb as you evade the attack by subtle movement of your body which improves your tactical position to launch your own attack. Now that that has been explained, it should be noted that this strategy is has more than one beat to its rhythm. The first beat is provided by your opponent who is attacking. It may be a punch, kick or anything launched at you. Once he attacks you, counter by initially yielding by evasion/deflection in such a way that you do not sacrifice positioning to counter attack. Remember that the crux of this strategy is the multibeat rhythm. You do not have to physically block anything. For example, if my opponent attacks with a forefist to my head and I step diagonally forward and to the side striking him with a wing arm after his punch goes by, this is still yield and counter. Stop Hit: The stop hit strategy is rarely used. As a result of its infrequent employment, it could be quite effective if you can pull it off. Basically, stop hit can be broken down into three categories: offensive, simultaneous, and defensive. 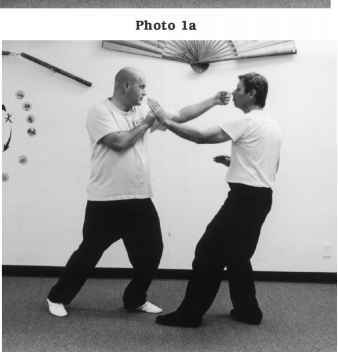 All forms of stop hit are characterized by the interruption of the opponent's momentum. Offensive Stop Hit: Offensive stop hit results when you read a telegraph in your opponent's movement that indicates to you that he is beginning to implement an offensive strategy. This telegraph can be as subtle as a weight shift or as obvious as the drawing back of a clenched fist. In either case, you immediately act on your perception and strike him first thereby interrupting his attack prior to its conclusion. For example, my opponent and I are squared off and I observe his facial muscles contract as he clenches his right fist and starts to raise it, I immediately strike with a forefist to his nose and stop hit him and interrupt his attack. Yield and Counter: photo 2a shows myself and an opponent who is about to attack me with a forefist to the face. 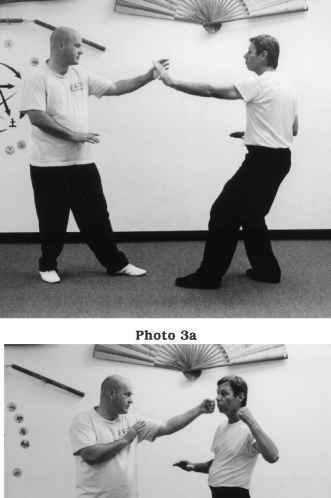 As he attacks, I yield with foot work and, by angling my body to stay oriented toward his center, as I strike him with a wing arm as shown in photo 2b. surprised, however, by the collision. Offensive Stop Hit: photo 3a shows me facing an opponent just prior to his attack. He telegraphs his intention by shifting his weight and raising a clenched fist. As soon as I detect his intent, I explode forward with a forefist to his face before he can complete his attack as shown in photo 3b. as I shift my weight back. As I am going back, I swing with a hooking punch with my lead hand. My opponent is striking forward as I am leaning back. My hooking punch strikes him in the head. The difference between this and yield and counter is that there is only one beat here. If I had yielded and sprung back to strike him it would have been more than one beat and therefore yield and counter. Since this was a single beat, it is considered a defensive stop hit. Simultaneous Stop Hit: photo 4 illustrates my opponent initiating an attack but he does so in such a way that I do not react as quickly to his action. I launch my stop hit and we hit each other. He is likely to be surprised by the collision whereas I expect it. I will probably be able to change better as I was mentally prepared for the hit and his momentum was interrupted. Defensive Stop Hit: photo 5 results from the same conditions regarding the reading of my opponent's telegraph as in the simultaneous stop hit; I read it at the last possible moment. His forefist races toward my head and I instinctively move my head back and to the side as my hooking punch lands. 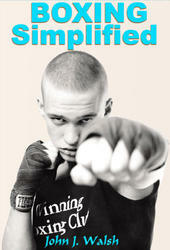 Footwork: The ability to control distance through effective and deceptive footwork is also a key to effective fighting. As most of you are Ba Gua practitioners, I am clearly preaching to the choir on this one. The circle walk and changes are excellent for developing footwork. However, do not neglect your training by failing to supplement your form with drills that work an explosive take off. Many find trouble in remaining rooted after a strong push from the ground to launch themselves forward. Remember you must stay down. I have seen many people, myself included, try to work into critical distance to launch my attack only to blow it by rising up out of root as I launched myself forward with a strong push. The key, I was taught, is the angle of the bubbling well of the rear foot in relation to the dan tian. If the angle is too small you will be launched up. If the angle is too great you will lose power. I find for me the optimal angle to be about 45 degrees from the dan tian to the bubbling well of the rear foot. It would behoove you to experiment with this. At the Chinese Boxing Institute International, James Cravens will periodically check this by an interesting drill. We tape off a ten foot line on the floor and he times us. From the still position and from moving in place, he times our ability to move the dan tian from one line to the next. Initially quite humbling, with the minor corrections I mentioned above you would be surprised how quickly you can move. At 6ft and 225lbs I am not built for speed. But, I am able to move my dan tian 10 feet in .75 seconds. I have seen those little skinny guys do it in .54 seconds. Now imagine if you are leading your attack with a whip hand, clearly that will land in less than .5 seconds even for a slow poke like me. You can do the same with a little practice. Just play with the angle between the dan tian and the bubbling well of your rear foot and you will see what I mean. This is a useful skill to develop. As you recall from the discussion of the strategy of stop hit, the ability to read the body language of your opponent can give you a great advantage. It is quite logical then to realize that if you develop the ability to conceal your intentions through the development of nontelegraphic skills, and to conceal your intentions through movement, you are less vulnerable to your opponent. One exercise I was taught to develop this is to isolate the action and relax. 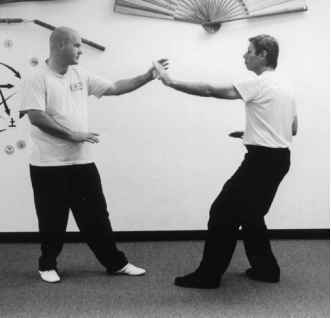 For example forefist, your partner hold a focus mit and you strike it. If you telegraph, he will move the mit. Your partner must tell you what the telegraph was and help you eliminate it. Once you can do it well, increase the distance to work speed and the nontelegraphic aspect of the strike. Also, strike from motion and see the difference. You need to know what your abilities and limitations are at given distances. This helps you know when you need to move closer as well as when you are at a vulnerable distance where you must either attack or increase the distance for your safety. This drill can be modified to improve/develop whatever your favorite methods are. But, remember the principles are the focus. Footwork: photo 6a shows a small angle between the dan tian and the bubbling well of the rear foot. This angle tends to diminish the power of the launch and raise one up out of root as seen in photo 6b. Footwork: photo 7a shows an approximately 45 degree angle between the dan tian and the bubbling well of my rear foot which I personally prefer to maximize the initial power of my takeoff with out compromising a verticle posture and coming way out of root. This is shown in photo 7b. Footwork: photo 8a shows too great an angle between the dan tien and the bubbling well of the rear foot. This results in a loss of power during the takeoff as shown in photo 8b. Nontelegraphic development: photo 9a shows me concentrating on silencing my body and focusing on explosively striking the mitt without any unnecessary movement. When done correctly, your partner is unable to move the mitt before you hit it. Photo 9b shows what happens when your partner reads a telegraph prior to your strike. violate any of the fundamental principles. Always be able to change and do not put all your eggs in one basket. Take advantage of movement and the opening will naturally be there. However, just as in qin na, do not force it...relax and let it happen naturally. So, how does one develop combination work? Simply be aware of what your body is capable of and its mechanics. For example, all Tai Ji people will remember the simple folding exercises. I push with my hand and it is deflected. I fold and continue with my elbow. The elbow is deflected, so I fold and strike with my shoulder. 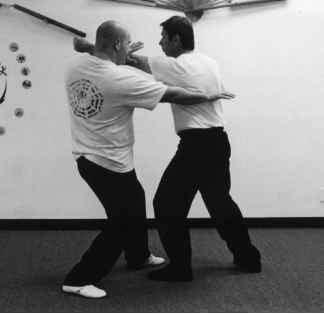 Wing chun people are familiar with bong sao and how it acts as a swinging gate. These are simple examples of understanding how the body works. It would benefit all of us to discover more of what our bodies are naturally capable of while remaining faithful to sound principles of boxing. The general topics that I have so briefly mentioned, principles, footwork, nontelegraphic development, and work on the development of combinations are all integral parts of effective fighting. When the average person sees an internal martial artist perform his form, the observer only sees physical movement and fails to appreciate the integration of our principles in motion. 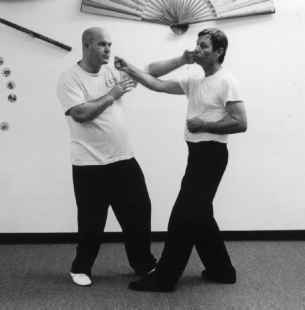 It has been said that Xing Yi is very simple on the surface yet profound in its teaching. This is because of the underlying principles that are the foundation of the art. This foundation is the same in any of the internal arts. 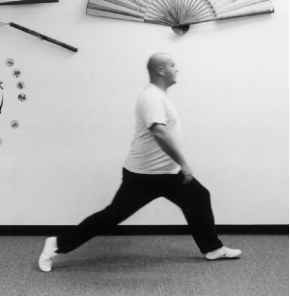 While Tai Ji is very well known for its suppleness and yielding, the same characteristics are is found in Xing Yi. Ba Gua is well known for circular movements. 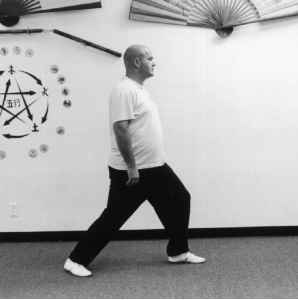 Is not an element of Xing Yi heng quan (crossing) where circular footwork can be found? If you have ever read the classic texts of the three major internal arts you will be amazed that they are all saying basically the same thing. Rely on sound internal principles, structure and relax et al..These things that you develop while practicing the internal arts realign your body for superior balance and centeredness. You get a calm mind and body that are critical in combat. When it comes right down to it, it will not matter very much what form you practiced yesterday when you are attacked or must defend another. The only thing that matters will be your ability to function under pressure in accordance to the principles of boxing previously mentioned, your ability to move and control distance, your speed, strategy and timing. 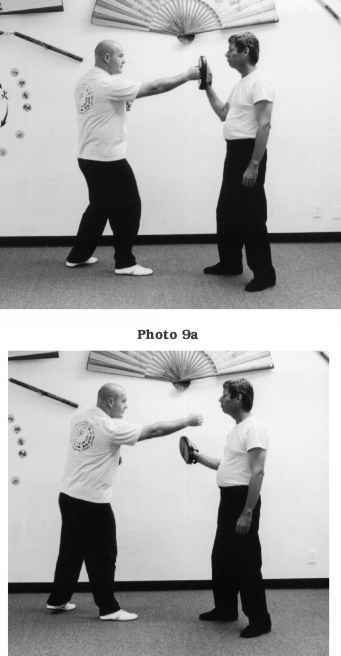 The person who has invested his time in practicing the internal arts will be much better prepared to deal with today's violent street element than one who relies on mere muscle and technique. I have been studying martial arts since I was about 10 years old and have skipped around many styles over the years.. After graduating from college, I entered the United States Marine Corps where I earned a commission and served as an infantry and reconnaissance platoon commander. Currently, I am a law enforcement officer in south Florida assigned to road patrol where I have the additional duty of being a field training officer. Also, I have been featured on the TV show COPS which originated in the district where I work. I am a student of James Cravens and study at the Chinese Boxing Institute International. I can be reached at the school (954) 938-6992. Or, e-mail [email protected].